My investigation into Amphibious Trilogies was carried out over three geographical sites and in a very different setting. The first part was carried out at Toubab Diallo at the Ecole des Sables, Senegal. It was a fantastic and deeply rooted experience. A literal return to one’s roots. 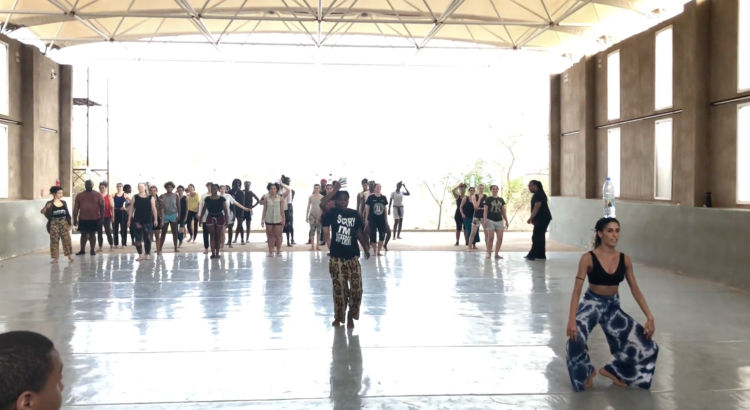 52 practitioners of Africanist dance gathered to learn from master dancers and master drummers, plus exchange knowledge about various diaspora retentions. It was deeply grounding, deeply spiritual and deeply unifying. The school is rooted in African movement tradition and hence has a sand studio as well as a studio with western dance floors. The entire event, like most African events that draw on tradition, started with a libation ceremony. Libation is the offering of water and or alcohol to the ancestors for their blessing (simplified explanation) and is considered the worlds oldest ritual. Already here I was contemplating the importance of water, and water as a present part of being amphibious. Water was scarce where we were. It was the dry season, and on top of that western capitalist company like Nestle had sucked up much of the natural groundwater, leaving particularly the young and “poor” without clean water to drink. Many places soda was less expensive than water, something that again makes present the violence, disregard for African life, and colonial presence that has never left the continent. Amphibiousness to me is about adaptability. Adapting to this life, to the conditions that continued colonialism enforces. That is being amphibious. Youth riding donkey carts as if they were fancy trimmed cars, blasting songs from iphones, images of the 18th century and hypermodernism being side by side. Juxtaposed, coexisting in ways one does not imagine when closing ones eyes in Norway. Yes this too was amphibious. All this was in heavy contrast to Norways frozen waters, and snow, and running rivers. Fresh water just lying there, neglected, not valued. Mobiles changed not because they stop working, but because there is a newer one out. It was cause to pause. The “House of Slaves” on Senegal’s Goree Island was, a first stop for some 20 million African enslaved destined for ships moored in the deep waters off Goree’s rocky shores. I know for a fact, that I have ancestors on both my maternal and my paternal side, who came through that island. being there, standing in the rooms where they were shackled, walking the path, leaning against trees that were standing to witness their destiny, their walk of tears. The major “mutation” that was brought on their bodies as a result of specific breeding programs, some of which I have copies of at home. Breeding slaves for physical traits. For adaptability. For amphibiousness. The black bodies ability to overcome and adapt, to be amphibious, that was part of its worth, part of its commodity, part of its object. That is and was part of me. Feeling the history, being faced with it, while white European tourist stand next to me, laughing, talking about the African ladies selling trinkets. Talking about one of the ladies buttocks and insinuating that her remembering their names meant she might sell them something more. Too numb, too sad to react. To overcome violence, violence that they were there to perpetuate. They celebrated the very history I mourned. I cried rivers, lakes, and oceans. But all on the inside. I would not give them more reason to celebrate. I carried water along the path. I did libation for my ancestors. I thought I would bottle some water from the ocean, but I could not. The guide said slaves threw themselves against the rocks after being raped, that many drowned after trying to escape. That sharks gathered because there was constantly food. I know that very ocean became their tomb, and also became a prison. Still to this day many african diasporans do not swim, do not embrace the ocean that separated them from their home, their loved ones. Againt these rocks their bones have been crushed. Here I poured libation. Here I mourned the dances they never danced. Here my soul was filled with weight it has yet to unload. African techniques for “grounding” and centering the body are in some instances linked to practices of carrying things on our heads. Most often water. Because of this my technique, Talawa, has a series of exercises in order to train these qualities. Some of them also practices of reflection, meditation and contemplation. This was part of what was shared in our master classes in both traditional and contemporary/secular settings. I found it hard to connect with Maihaugen after my trip to Senegal. Not because there is no connection. I grew up in Nittedal, taking the Gjøvik train every day, and have family very much tied to Mjøsa. However, it felt forced and empty compared to the deeply rooted and spiritual experience of Senegal. Also, I must add, Gorre island was and is still weighing heavily on my soul and spirit, and it was at that time even less digested. I, therefore, added my own third excursion, to an island of my own. My childhood and ancestral home in Nittedal. With my mother, who has created a pond. Through he,r I have learned to adapt and code switch, mix my blackness into the shades of Norway. In this garden I could connect, and meditate on the experience of Gorre, Maihaugen and how to meld them, these experiences of land and water, and hopefully regain my amphibious composure. Bringing it all together I devised an adaptation of a libation ceremony for the Norwegian project group in addition to our teacher/mentor Per Roar to participate in and experience. We would have a “water walk” where they would balance a bottle on their head, walking through Lillehammer, up to Maihaugen. While walking they were instructed to think about their ancestors tracing the water of their bodies back to the oldest memory (the oldest or furthest back ancestor they knew anything about). They should think about their lives, the steps they took so that we/they could be here today. Every time the bottle falls think of a time in life you stumbled but got back up, were the instructions. When arriving at Maihaugen we would “join the waters” and say our thanks to the ancestors, and let the water nurture a tree that was there to witness, much like the trees at Gorre Island, although the witnessing was surely more pleasant. The walk took 40 min longer than planned, and our ceremony at arrival was cut short,and partly interrupted. However it was a beautiful experience and one which it seems those presence enjoyed, at least when bottles were not falling. Per Roar at the crossroads…with water…mesmerizing. Here I have included three reflections from the participants. Per Roar, Kyuja and Katarina. PER ROAR “WATER BOTTLE RESPONSE”…på norsk. Å gå fra Sigrid Undsets hjem i Lillehammer sentrum til hjertet av Maihaugen friluftsmuseum, balanserende med en flaske vann på hodet, satte kulturelt betingede tradisjoner knyttet til det å bære vann i bevegelse. Med meg i balansearbeidet ble jeg bedt om å ha mine formødre i tankene. Ved å søke en imaginær dialog med deres livserfaringer på tvers av alle brutte tidslinjer opplevde jeg gjennom min vandring at jeg krysset grenser mellom ulike tidsaldre, fra det nåtidige i trafikkerte bygater til museets fastfrossede bilde av en svunnen tid: med den gamle stavkirken og den bratte grusbakken opp til plassen ved det vesle fiskerkapellet. Her lå en rekke av de gamle fiskebuene bak oss, dammen foran oss med de fattigslige seterbuene ovenfor i de karrige bakkene. Flasken med vann var et hjelpemiddel til å holde fokus på det åpenbare, det som krevde min oppmerksomhet og interesse. Balanseakten vekket til live gamle demoner så vel som en følelse av flyt og sammenheng, til tider blødende nært og inderlig, til andre en praktisk og teknisk kalkulering. Slik utfordret selve balansearbeidet både min opplevelse av meg selv og av tid som materialitet. I avslutningsritualet ved dammen hvor alt vannet ble samlet i en kalabas, ble på en måte også alle våre felles anstrengelser samlet. Handlingen gjorde meg til en del av noe større. Hvor mine spekulasjoner om formødre, mine forbindelser til dem og livet her og nå fikk inngå i en større sammenheng med de andres takket være et afro-diasporisk vannbæringsrituale – midt i hjertet av samlingen av østnorsk kulturarv. I found Libation ritual very fascinating! While a water bottle that has a symbolic meaning of the original water of our life came from the ancestors in it keeps its balance on the head. The ritual led by Thomas Talawa Prestø in Lillehammer that is considered as the worlds oldest ritual sounded simple. But in fact, it was a challenging, deep and advanced practice to me that reminded me of a precious aspect of life: Connection. Walking is one thing that I do every day as I live and breathe. Keeping the water bottle in balance on my head is something new to me, although I have seen many beautiful pictures of women in both Africa and Asia who carry water or goods on their head for their life as a way of tradition transporting. In the beginning of the ritual, I tried to make the water bottle in balance on me. I dropped it constantly so very many times and I could not even move forward because of the interruption of its falling. I was behind of everyone in the group. And then I realized that I could not move on further like that way. I stood still silently with deep breaths for a while, softly closing my eyes in the middle of the road to Maihaugen Museum. And soon I started feeling my spine like a snake rising up. I could feel the connection to the water bottle through it. It felt that the water bottle was like an extension of my spine, although time to time I still dropped the water bottle from my head. I remember that the moment when I put the water bottle on my head again, letting go of my stress to keep the water bottle in balance on me, my steps were not the same ones as I used to walk before. The balance of it was found by itself on my head when I dropped my attention to keep its balance. I could not just walk anymore but I needed to connect to the water bottle first in order to keep walking forward. It felt that the falling water bottle from my head was like a bell that wakened me each time when I lost the connection with it. Once again I was well reminded by the whole experience of Libation thanks to Thomas, about the importance of connection to our original water/root/source. And the connection is the key to open the balance be invited in me and the harmony be invited among us. For me, life is not something just to live as I just could not walk some point during the ritual. We all have invisible water bottles on our heads I think. And It is all about how to live well without giving up in deep connection to the invisible water bottles on our heads that contain the original water of our life in it. In that way, I trust that the harmonious balance is found by itself in us and around us just like the Libation ritual walk with a water bottle on the head. I hope one day I can experience it fully again if its possible, especially the end part that was interrupted by suddenly entrance of some audience. I am very glad and grateful to experience the precious ritual. Thank you dear Thomas and all who experienced it together! Father, son, sister, brother, daughter, mother earth, today we wish to honor you with a gift! This gift is a thank you for the abundance that you share with us all! right now and in the times to come. Here I sit, wondering, where I am, Gorre Island, Maihaugen, my mothers garden island…I guess I am somewhere in between. Thats why I must remain…amphibious.